We have had such a busy term so far and enjoyed a range of Focus Days. After our successful BLP number day, we organised our investigative Science day. The children got to complete a range of investigations throughout the day and practise making predictions and conclusions about what they had learned. In Reception the children made their own lava lamps, investigated friction by completing a range of magic tricks with a balloon and completed a range of experiments with jelly! 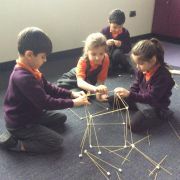 In Year 1 the children made their own sycamore seeds and investigated which ones travelled the furthest, they also created their 3D structures using just spaghetti and marshmallows! This week we are celebrating outdoor classroom day. We have a range of activities planned including den making, water investigations and mini beast hunts. I know the children are going to have an incredible time and seeing their confidence grow with completing these problem solving activities has been wonderful. A parent wrote to us to say ‘I wanted to offer my feedback and thanks for the extra effort everyone put in last term; in particular for the Focus Days and World Book Week. It seems as though they have had a real impact on the kids’ enthusiasm for key subjects. My daughter said the problem solving day was “the best school day ever”. Of course, this was lovely to hear but what has impressed us more is the change in her behaviour and approach to maths since: she is less scared of numbers than before and has a much more positive and resilient approach to problem solving at home. They both told me about the displays, read-athons, and other exciting activities that the staff worked on for World Book Week. They already love reading but I was surprised at how eager they were to complete their own book for the competition – it’s the first time they’ve voluntarily pursued a homework project together and I’m certain that this enthusiasm was them mirroring the attitude and effort of the teachers. All of this - and other initiatives that your team has delivered - such as: genius hour, dojo points, the House Council, golden pencil awards etc. all add up to the twins being super excited to return to school this term. So, thank you! Feedback like this is so encouraging to hear and to know that our parents and the children have valued the events organised for the children. We look forward to holding more Focus Days in the future.